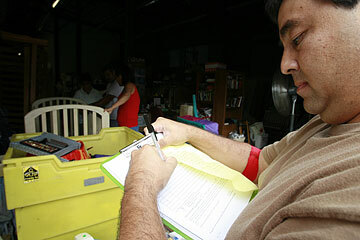 Scott Miyamoto fills out a donation form at the Helping Hands Community Clearinghouse in Kalihi. Miyamoto has donated to the clearinghouse for the past seven years. Aikahi Elementary School and Castle Medical Center employees adopted the most families in need in the Community Clearinghouse's Adopt-A-Family program held during Christmas. In addition, employees at many companies gave up their annual Christmas party to buy presents for needy children, said Maria Chomyszak, program director. The Star-Bulletin raised $13,175 during its annual Good Neighbor Fund drive in its contribution to the program, which is run by Helping Hands Hawaii. Of the 94 local families the program helped this past Christmas, Aikahi Elementary adopted 20, and Castle adopted 17, Chomyszak said. The school has made it a tradition for the past several years. Employees at many companies who sponsored families have felt so gratified that they've commented, "Wow! I can't wait to do this next year," Chomyszak said. United Airlines, which adopted three families, is one company that "goes way out" to give presents and gift cards that are age-appropriate and meet the requests of each family member, she said. United and other companies also "do more than what the family asks for" by getting something for the parents, who usually don't request anything, she said. "It's amazing -- they (United) are really, really good" about helping out every year, Chomyszak said. But Chomyszak said she hopes the public doesn't forget about the needy the rest of the year. By July or August, the clearinghouse's warehouse empties out and finances are stretched to the maximum. "We are so appreciative (of the donations), but there is never enough. We always have more people we could help if we had the money. ... Poor people are poor year-round, not just at Christmas," she added. The clearinghouse has a quota of funds to provide emergency assistance for rent and utilities each month, and every month there are families that have to be turned away, Chomyszak said. "You know what I would love to see donated more? Diapers and (baby) wipes. Fifty percent of the people ask for them because diapers are expensive and people need them. The agency spends $35,000 to $40,000 a year on diapers and wipes," she said. Many families were not adopted and others did not receive donations that were specified publicly through the media. Chomyszak said "we do as much as we can do" by matching up the family wish lists with leftover donations. "No family went home empty-handed," she said. Of the families helped, 97 percent are considered low income, making below $29,799 per year, according to Chomyszak's summary report. Most applicants, who must be referred by social service agencies, were between 20 and 34 years old, and most were female. One quarter of them reside in Honolulu, followed by Waianae and Waimanalo. Two percent were homeless. Most families consisted of between four and seven people.